Eurocode 1, Part 1 to 3, or the national standard DIN EN 1991‑1‑3, describes the general effects of snow loads. 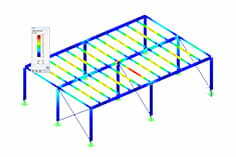 In RFEM, the load applications for duopitch, monopitch and flat roofs required by the standard are already included in a tool in order to easily generate these effects. Depending on the required National Annex of the standard, you can select the snow load zones by double-clicking on the map stored in the program, which adds the basic parameters for determining the load. 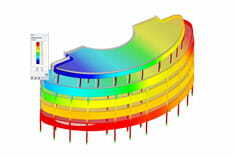 After specifying the roof geometry and the generated load cases, this information is automatically transferred to the structure to be designed.